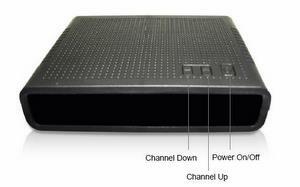 Tatung ATSC Digital-to-Analog converter Box stands a pioneer and cutting-edge role in the completion of the digital TV transition. Designed to easily receive over-the-air ATSC standard definition terrestrial broadcasts, it has ability to provide onscreen program information sent by local TV broadcasters to easily identify details of TV programming. Indeed, flexible video format can fit any TV programming display with 4:3 center cut-out and 16:9 transmitted image. With a SMART Antenna interface, Tatung ATSC Digital-to Analog Converter Box intends to receive digital TV signals for all-angles signal reception at any kind of location without interrupting. Moreover, it is developed from the consumer perspective to maximize value and performance. This includes all channel tuner 2 - 69 display with all DTV formats display, with RF (F connector) output, Composite (3 RCA plugs), basic remote control, energy saving function, with parental control for program rating with V-chip, and closed-captioning (16 indexed and true colors graphical MENU with EPG).